Sahej Rahal’s hybrid beasts look real in a world marked by distortion and false propaganda, suggests Shweta Upadhyay..
Sahej Rahal. Pg. 49, Juggernaut folio. Mixed media on paper. 41.75” x 31”. 2018. Image courtesy the artist and Chatterjee & Lal, Mumbai. Sahej Rahal’s absurd monsters seem to have escaped from a labyrinth. Descendants of the Minotaur, these part human, part animal hybrids are impossible and fantastic: they are militant and ludicrous at the same time. These larger-than-life figures that have crawled from the cracked bed of the underworld fill the entire surface of the canvas. Rahal uses mostly two colours – variations of saffron and black in this series of paintings – which give the effect of the beasts emerging from the landscape or as being embodiments or mascots of the landscape. Confronted with their bizarre bodies and totems, with whirlpools and moons in their glares, you forget that landscapes were once idealized as part of the celestial feminine! These paintings along with sculptures and an AI programme were part of Juggernaut at Chatterjee & Lal, Mumbai, from the 16th of January to the 2nd of March. This series draws from mythology, science fiction, Manga comics and video games, among other sources. Rahal claims that his work is to be seen as a “form of world-building” and part of an unfolding meta-narrative. The paintings are presented as pages of a book. The show is a narrative within a larger narrative, like infinite fiction. The term Juggernaut is actually derived from the Sanskrit word ‘Jagannatha’ meaning lord of the universe, after an annual chariot procession in Puri. The term is now used in English in the sense of a moving behemoth with untrammelled power and crushing force that demands sacrifice, and in the Indian context is also a reminder of the ignominious rath yatra by right-wing groups that culminated in the demolition of Babri Masjid. Juggernaut is also a fictional superhero created by Marvel Comics. Monsters are relevant because when things go wrong we need them to call out the truth through the mirror of their grotesque forms. The unspeakable or the threatening breathes through them. Monsters rampage unseen and emerge from their covert addresses from time to time to warn us. These anomalous creatures embody difference and otherness. “Monsters provide a tangible site for exploring the problem of what constitutes acceptable human identity,” claims Alexa Wright in Monstrosity: The Human Monster in Visual Culture. Through their presence, we are offered an opportunity to rectify the self. 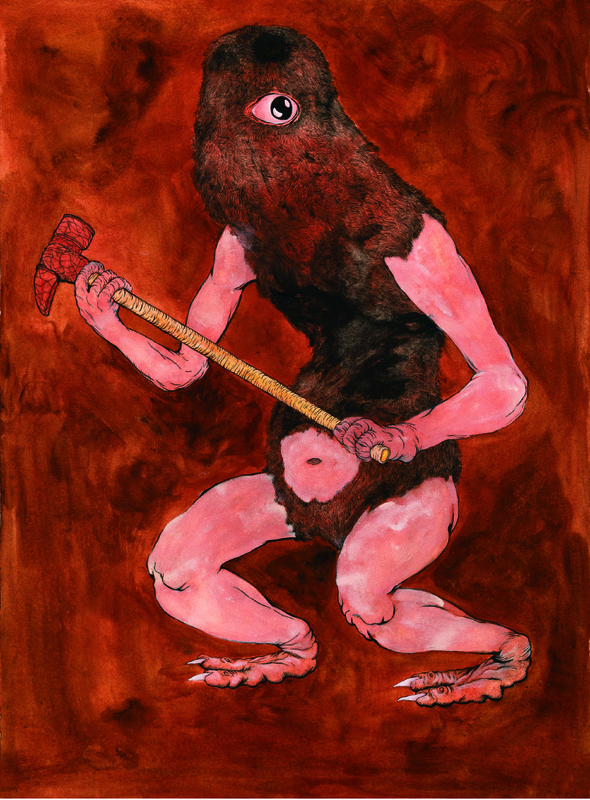 Rahal is not the first artist to use monsters to depict squalor and discord. Pablo Picasso’s 1935 work Minotauromachy addressed the issue of toxic masculinity through the figure of the Minotaur. Closer home, Vivan Sundaram held us hostage with an army of strange creatures in his Emergency series. Bomb Cluster depicted an angel of death with a bomb as its body and an array of bullets as wings. Rhino showed a rhinoceros wearing a bandolier strung across its body with weapons jutting out of its thick, metallic carapace. What happens when surreal monsters become part of the mainstream? What if the formerly unnameable, feral beings get an identity card and institutional support? In recent years, the country has witnessed lynch mobs, fake news and persecution of minorities. This has resulted in a world distorted by mass delusions and popular phobias. Truth has lost its value. In such a world, Rahal’s monsters seem like “realistic reportage”, as Hannah Arendt described George Grosz’s cartoons. Another reason why Rahal’s fiends cannot be seen as characters from a book of imaginary beings, after Jorge Luis Borges, whose brand of fabular fiction has been a source of inspiration for him, is because of their colour scheme. These monsters’ emergence cannot be read apart from the saffron brand of politics that has swept the country in recent years. In a direct contest, Rahal’s imaginary beings recall the angry Hanuman stickers that have been glowering from bikes and cars in several cities recently. In the viral sticker, the benevolent Monkey God is rendered as a macho, wrathful figure with strong frown lines. It was soon co-opted by right wing groups as a symbol of muscular power. Rahal’s imagery, although menacing, critiques the horror of militant and hyper-masculine Hindutva. It is through the layering of his images that Rahal makes his point. His beasts are assemblages that draw from a range of influences. The sculptures that look like grand, regal weapons, are made from salvaged detritus and found materials like incomplete idols and legs of forsaken tables. Final Mother, a goddess of trash, fashioned from sheets of compressed plastic, aspires for a multi-layered history through its stratified body. Even the blob-like form in his video, named Juggy, at each reset, takes different paths, grows different appendages on its journey, is thwarted by different obstacles, and is reincarnated again and again. Rahal’s works are polymorphous and against the notion of a pure, original or unitary self.